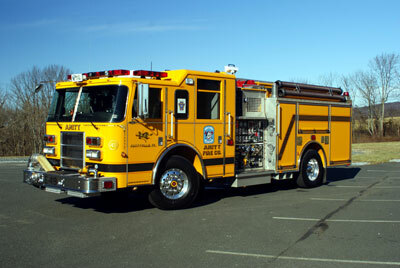 Engine 49 is a 2005 Pierce Dash CAFS custom pumper. This unit is equipped with a 1500 gpm pump, 750 gallon water tank, 50 gallon class "A" foam cell, Hercules 140cfm air compressor, and a Husky 10 foam system. The engine carries 1200ft. 5" supply hose, 600ft 3" supply hose, 1 preconnected 500gpm Mercury attack monitor, 1-100ft. preconnected trash line, 2- 200ft. preconnected 1 3/4" lines, and 1- 200ft. 2 1/2" preconnected line. The engine is also equipped with a Harrison 8KW generator, which powers the scene lights and a hydraulic ladder rack, which holds 48' of ground ladders. Some other special features of this apparatus are the remote controlled Akron Saber master deck gun and external foam tank fill which allows our members to stay off the top of the truck, which can be quite hazardous. This apparatus responds first due to all fires. *E49 is also AED equipped.